Back to the theater with an eye for fun. Choreography rehearsal at Zach Theatre. One of my favorite theaters is producing the musical, Priscilla Queen of the Desert. Usually my involvement in their marketing is to create signature images for each show, before the season begins, which become part of the season brochure, and then, the other half of my involvement is to photograph the dress rehearsals of each production, which normally happen the night before the first performance for the run of the show. Lately though I've wanted to get more involved in creating additional content in the weeks before the show openings in order to help build fun "back" stories to help get the shows on peoples' radar earlier. I got in touch with the P.R. people at the theater and offered up my time to shoot some behind the scenes documentation leading up to the dress rehearsal. They thought it was a good idea and we put it into action this week, on Tues. evening. The production is three weeks away from the dress rehearsal and Tues. evening's rehearsal concentrated on choreography. I showed up after a long day of dealing with the details of other projects. We were on the rehearsal stage instead of the main stage. I knew that we couldn't interrupt the rehearsal in order to direct people for photographs, and I also knew that adding lighting to the rehearsal experience would be a huge distraction. 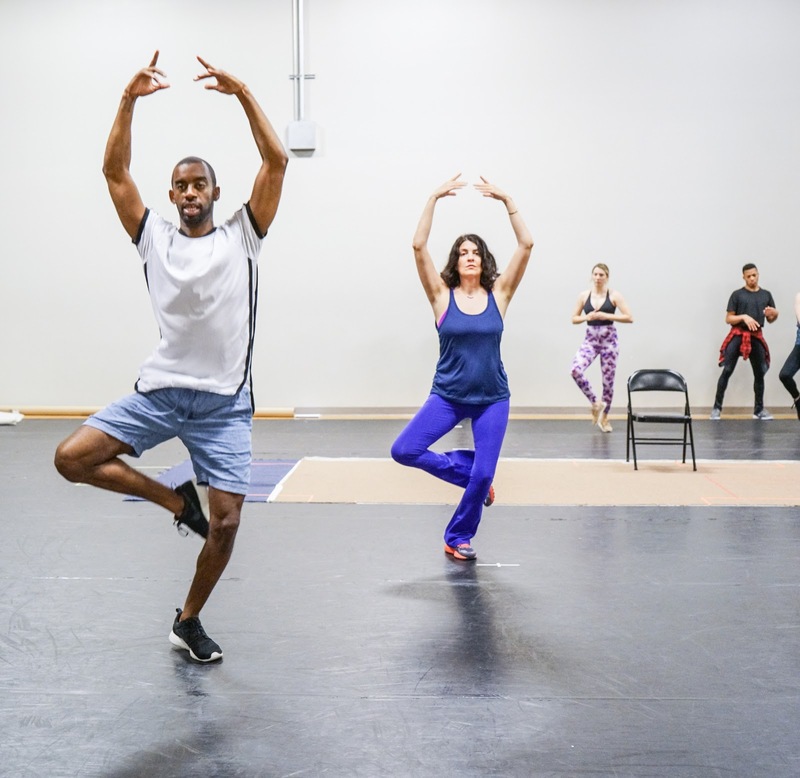 Time is a precious commodity in the theater and I didn't want to slow down any part of the rehearsal process. I brought two cameras along with me and a little collection of lenses that I thought would be most useful. The cameras were the Sony A7rii and the a6300. The lenses included the Rokinon 135mm (f2.0) and 85mm (f1.4) Cine lenses as well as the 30 mm Sigma f1.4 (for the cropped frame camera) and the 24-70mm Zeiss lens for the full frame camera. I used everything in the bag. The lighting in the space is anything but optimal; banks of fluorescents way up at the ceiling level about 30 feet up. There was no lower light source to toss fill light back into the actors' faces. I made liberal use of the higher ISOs in both cameras, sometimes using auto ISO and setting the top limit to ISO 6400. My goal was to show the choreographer leading the group through some of the key musical numbers. I shifted from the 24-70mm (for wide and normal shots) to the 85mm and 135mm to isolate key performers and to take advantage of the very narrow depth of field I got from shooting wide open, and near wide open. The a6300 and the 30mm lens were used for wide, establishing shots. I wanted to show the size of the cast and to show the rehearsal environment. Focusing the long primes was easier than I anticipated. The focus peaking in the A7rii was very effective and I guess there is some muscle memory hidden deep down that was partially awakened by the process of manually focusing on moving subjects in so-so light; something I had been able to routinely do back in the days when there was no real alternative. The shimmering, yellow edge indicators of the focus peaking were a great guide and, after a few minutes of tentative double checking with focus magnification, I became confident enough with the focus peaking to just go for it. The important thing I tried to remember was to change the focal length of the manual lens setting in the image stabilization menu as I switched between the 85 and the 135mms. I got a lot of great images of small groups, individuals and the whole ensemble with every image containing moving subjects. During my two hour visit I was able to shoot about 500 frames. I narrowed these down to about 350 to share with the marketing team. You never know which way an organization will go on image selection so I always err on providing extra coverage. The mood in the rehearsal studio was pretty jovial. I had worked alongside many of the actors a number of times before. The musical director and I go back a couple of decades. The director and I have worked on dozens of shows together. Each person seemed very assured that I would only shoot them in the best postures and expressions; or at least if I did catch something less than flattering it would be excised in editing and never see the light of day. This isn't photojournalism after all. At one point I felt like I'd gotten a good range of images and I checked in the with the P.R. person who was kind enough to attend along with me. I showed her some images on the screen and asked for her opinion. She was happy with the stills but asked if I might also be able to shoot some video (some of the dance numbers were wonderfully visual...). Yes! Of course I can. I knew that one of the in-house production people is a really great video editor and I jumped on the opportunity to create fun moving images and then leave someone else to do all the heavy lifting of actually editing something nice together. I put the A7Rii in full frame, 1080p mode, set the camera to 30 fps (the editor's preferred setting), shutter speed at 1/60th and made sure the rest of my video settings were appropriate. The 24-70mm was the perfect choice for videos that would capture wide shots and then tighten in to single person shots. I also knew that it was more than sharp enough to be used wide open for 1080p video. I back-tracked and started shooting the video counterparts to many of the still images I'd been capturing. There is one scene that starts with two actors and builds to the full cast. It lasts about one minute and forty five seconds which really pushed me to work on my handholding technique while depending on the image stabilization from the camera. Since I hadn't expected to shoot video I didn't bring a tripod along with me....( bad boy scout...). Much as I liked the still images I ended up loving the video clips I shot. There's is so much energy in the show and it's not always easy to capture that in single, still frames. Video seems to be the perfect adjunct to the stills we used to shoot exclusively. It felt great to be able to hand the client twice the coverage. I delivered the video clips this afternoon and I can hardly wait to see what our editor does with the files. A lot of it will make for tasty b-roll but some of the footage of the whole musical number will make for great, short videos on places like Facebook and YouTube. Of course, I have an ulterior motive in offering my services in this capacity; I would love to start training corporate clients to think of video not only as perfect, three minute presentations with a year long lifespan and high production quality, but also as weekly or monthly content refreshment for websites and other marketing outlets. Looking behind the scenes and catching more spontaneous interviews and insightful moments that make a company and their product or service more topical and relevant for consumers. What better way to practice and create example footage for those potential new revenue sources than to immortalize my theater client's inspired interpretation of Priscilla, Queen of the Desert?? ?